There’s a new kid in town in the event space, and it’s New York startup DoItInPerson. Founder Aron Schoenfeld realizes that the event space is very crowded but it’s also very fragmented. There are event discovery startups, event community startups, event social networking startups, and event ticketing startups. DoItInPerson is taking all of these fragmented pieces and putting them together in one platform. Their all in one platform promises one place to go for managing, promoting, and discovering events and communities. Schonfeld has covered everything about an event with DoItInPerson. Using their platform you can create and manage your community, find and book speakers and sponsors, create and sell tickets, create partnerships, invite attendees, and monitor how it all fits together. Schonfeld found, through putting his own events together, that he was using different tools for each thing. There are already a handful of great event organizers who have turned to DoItInPerson and discovered that the platform delivers everything they say it will. 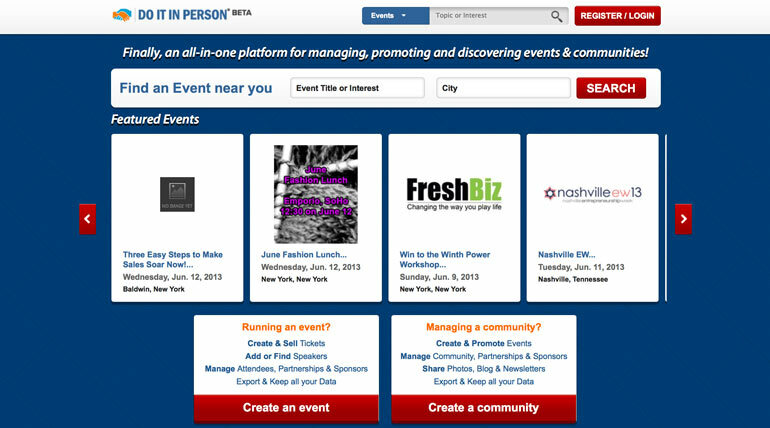 DoItInPerson.com is an online event platform that allows people to create, manage and promote events and communities. It brings all of the fragmented pieces of the event space together; from creating and managing your community, sending newsletters, booking speakers, selling tickets, adding sponsors to managing partnerships. Our goal is to simplify the event process and create data around events and communities that will help organizers sell more event tickets. The company was founded by Aron Schoenfeld. Aron is an accountant by trade and has worked on multiple startups. His first startup, which he still currently runs, is DreamArtists Studios, a boutique music production company that has composed theme music for shows such as ABC’s Good Morning America and 20/20 and ESPN’s Year of the Quarterback. Very intense. Everyone wants to work on a startup and there is a lot of hustle going on. Unfortunately, I think that in NY we see more ideas and less actual startups than in other cities. Our company aims to solve and eliminate the fragmentation in the event space to make it easier for organizers to create, manage, and promote their events in a way that adds meaning and relevance to their events. Currently organizers are forced to use multiple sites and platforms, which leads to a lack of cohesive data across the event space. Through consolidation, we will be able to provide organizers with the data they need to create better events and collect more event registrations. Getting people to see the value proposition and why we are different then our competitors. Many people are familiar with other ticketing sites or other community management sites. We spent a lot of time refining our message to show people we are not just a ticketing or community platform. We recently had our 100th event run on the site and have had over 1000 registrations. Our goal now is to hit 500 events, get more activity in the community aspect of the site and focus on having people use the speaker portion of our site more, which I believe adds tremendous value to the events and seems to be a lot of people’s favorite feature. My mentors include Sergio Fernandez de Cordova, who taught me a lot about what I know about entrepreneurship and has helped me any time I have had questions or issues. My role model is my father who as a salesman, worked extremely hard all the time to make sure we had whatever we needed, but more importantly, always put family first. Whether driving to the Catskills in traffic every Thursday night in the summer to spend the weekends with us, or never missing a school event, he put family first, no matter how busy work was. We just launched a redesign for the site and are focusing on making the site a more responsive design. We also plan to launch 5-6 new key features to give the site broader appeal and are hoping to get 4-5 large conferences using the site over the next few months. Pingback: Why Is The Big Apple Becoming the Big Tech Apple?